Dunnsmouth is diseased and rotten to the core. Beset by malefactors supernatural and mundane, Dunnsmouth slowly dies in the swamp. But within the rot are mysteries to be solved, evil to be fought, and the Weird to be encountered. Scenic Dunnsmouth features an innovative village generation system using dice and playing cards to ensure that every expedition to Dunnsouth is unique; the adventure never plays the same way twice. The threats, their intensity, which villagers are present, which alliances they hold, and even the village map, are all randomly determined before play. 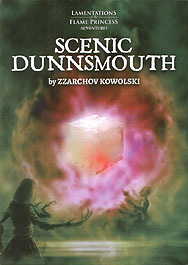 Scenic Dunnsmouth is an adventure for characters of levels 2-5 for use with Lamentations of the Flame Princess Weird Fantasy Role-Playing and other traditional role-playing games.